It’s a great feeling to be showered with doggy kisses from our bfff – best furry friend forever. His kisses are sweet signs of affection! Sometimes, however, excessive licking can take on totally different meanings and not necessarily mean that Rover is showing his love for you. 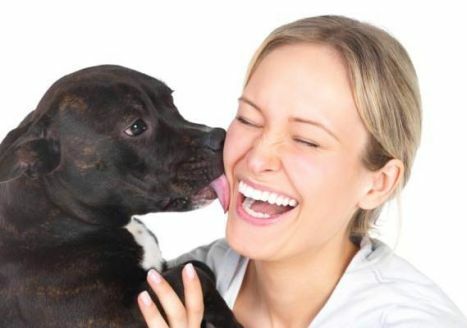 Here are 5 surprising reasons that we found as to why dogs lick us! Your Dog Thinks You’re Tasty – Yes, your dog might be licking you because he likes the way you taste! If you have a teeny tiny bit of food left on your hands or face, your buddy might not be able to resist licking your skin till the food’s all gone. Your pup might also be attracted to the salt that is present on your skin or to any new, interesting scents you might be carrying. Licking you can provide your dog with all sorts of information such as where you have been and if you encountered other dogs sometime during the day. He’s Trying to Get Your Attention – We know that when dogs stare at us for a long time that they’re trying to get our attention silently. As you and your pup both know, sometimes staring just won’t do the job. When the classic nose nudge or paw prodding tactics don’t work for your dog, he will resort to actions that he knows you can’t help acknowledging, and one of those actions is licking! If you notice your dog doing this, make sure he has enough water and food. Consider giving him some attention by playing with him or taking him outside for a walk or a potty break as well. She Wants to Relieve Stress – Many experts feel that when our dogs lick us, themselves, or other objects, they’re actually trying to relieve stress by releasing endorphins. Licking is a pleasurable action for dogs, so this may just be a way for your pup to pass the time in a relaxing manner. Your Dog Is Healing Your Wounds – This is an animal instinct that dogs share with their ancestors – wolves. When a member of the wolf pack was injured, other members of the pack would attend to that wolf and lick his wounds. Your dog might be trying to do the same to you as well. Their saliva contains enzymes that kill any bacteria around the wound area, allowing it to heal. Because this action is an instinct, your buddy might be thinking that she is helping your feel better more quickly. He Wants to Tell You Something – Barking, whines, and growls aren’t the only avenues dogs have to communicate. Licking is a way of communicating as well! After all, puppies lick their mothers as a request for food, and dogs tend to lick other dogs’ mouths as a sign of respect or submission. When your dog licks you excessively, he might be trying to tell you something, so try to find out what it is your dog wants! Here at BauserHaus, we love taking care of dogs and getting puppy dog kisses! We make sure to attend to all your dog’s needs and provide them with lots of fun playtime with other dogs in their size range. Make your dog happy the next time you go somewhere without him – bring him over to BauserHaus! Call us at (314) 961-3911 or visit us online at www.bauserhaus.com to find out more! This entry was posted in Tips and tagged BauserHaus, dog behaviors, doggie daycare STL, reasons dogs lick you, why do dogs lick us?. Bookmark the permalink.